In Ash Falls, supernatural creatures run the underworld. Spirits stalk the streets. Dark magic kills more people than firearms. Located beneath a mysterious, evil vortex that First Peoples flatly referred to as “the hole in the sky,” Ash Falls remains off-the-map as far as most modern earth-dwellers are concerned. But for those unfortunate souls who have found themselves pulled in by its dark forces, Ash Falls is not only home, it’s a living nightmare where evil never sleeps. 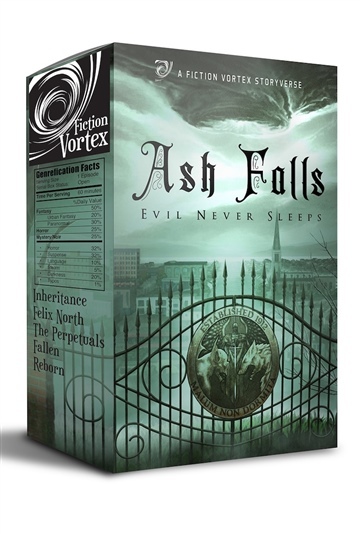 Each of these serials crisscross paths within Ash Falls as they describe the chilling, supernatural events that take place within a lost American city where evil never sleeps. This storyworld is for readers who enjoyed Under the Dome, The Dresden Files, Supernatural and Eureka. Jeremy is a retired musician, fighting back against adult-onset epilepsy armed only with imagination, keyboard, and monitor. Early exposure to the balancing influences of H.P. Lovecraft and C.S. Lewis have created a life-long interest in creating fiction that makes a person think as well as feel. He prefers dogs to cats, whiskey to vodka, and role-playing games to shooters. The brainchild of a ragtag, vanguard of indie authors, Fiction Vortex™ emphasizes imagination and fun while breaking outmoded conventions. Fictionite™ is our first mobile app. Inside it, you’ll discover collaborative StoryVerses™ pouring out lavish episodic stories from your favorite worlds as fast as you can read them. Our unique dynamics allow you to join the story via plot votes, character auctions, and influence polls. Our Augmented Reality technology transforms your reading nook into the nexus of the story. Once you discover Fictionite, reading will never be the same. So with bubbling anticipation, we invite you to join the story.